This drawing of London and the surrounding Thames countryside provides a fascinating blueprint of Regency London. The layouts of the ornamental gardens and tree-lined avenues of Hampton Court and nearby Bushy Park are shown in detail. These contrast with the depiction of Kew Gardens, which is left blank within its boundaries. 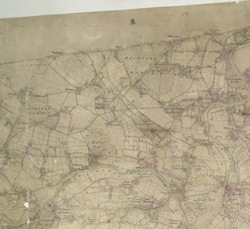 The Ordnance Survey Letter Book records: "When the Ordnance Survey of the vicinity of Brentford was made, The Surveyor was not permitted to enter Kew Gardens." At that time, King George III was recuperating at Kew from bouts of mental illness: the king's privacy and security took primacy over mapmaking.